Mount Timpanogos, east of Provo, is supposedly the most popular high Wasatch peak, probably because it is unique in having not one, but two trails to its summit. 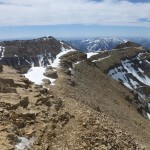 Three other, less popular 11,000′ summits lie along Timpanogos’ long north-south ridge. Since the ridge is all class 2, it makes sense to tag them all at once. 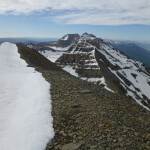 When the road to the Timpanookee trailhead is open, the natural way to do this is to climb North Timpanogos somehow, head south along the ridge, then return via the Timpanogos pseudo-glacier and trail. This was my last bit of business before hopefully seeing the last of the Salt Lake City area for a good long while. This being the Wasatch, sleeping at trailheads is Officially Frowned Upon With Guns, so I slept a ways away and set my alarm extra-early. Then I lay there for about half an hour convincing myself that, since I couldn’t get back to sleep, I might as well climb something. There was only one other car in the parking lot besides mine at 5:30, though the campground was full. Indeed, though it was a holiday weekend with good weather, I had the mountain to myself except for some casual hikers walking up to a waterfall a couple miles up the trail. Even when I returned after noon, the parking lot was mostly empty. Strange. In any case, after scratching my head at the map, I made my way to the top of the campground, then followed an old, gated road to where it ended at a water valve. The Grunge Couloir looked partly melted out from this angle, and the direct route to Woolly Hole looked like a mess with water flowing down it, so I bushwhacked north to the ridge, linking game trails where I could — not nearly as bad as it looked. The ridge was cruiser, with either a game/use trail or open forest. I followed the ridge to near where it intersects North Timpanogos’ north slope. It appears you can scramble up some rocks to reach the slope, but from here I could see that the Grunge Couloir was still all snow. Crampons on — time to get some. Even before I reached the couloir, I noticed a steady stream of pebbles and small rocks whirring down the slope, so I took out my headphones and started paying attention. This seems to be standard for the Grunge but, at least on the apron and in the lower couloir, it is easy to avoid the rockfall by staying to one side or the other of the obvious runnel. As I paused to rest, I admired the towering pile of rubble that is North Timpanogos. The couloir splits farther up, with the main Grunge going through a narrow funnel to the left. Since almost all of the rocks were coming from that direction, I chose instead to follow the right branch, climbing a short ice/névé step. With just my dull mountaineering axe, I had to experiment a bit to find places it would both penetrate and stay put. Above the step I followed a narrow strip of snow and ice, using axe, hands, and crampons in whatever way worked best. This is why I enjoy mountaineering more than pure running or climbing: it’s just you and whatever gear you have versus the mountain, weighing risks, then applying whatever techniques you know or can improvise, fully engaging body and mind. Near the top, I trended left toward where I thought the cornice looked easiest to manage. Working my feet up as high as I could, I stabbed the shaft of my axe deep into the top, then did a full-on “beached whale” onto the ridge. Whatever works. The ridge was mostly bare, so I stashed my crampons for the day, then finished the short hike to North Timpanogos. Most of the ridge is a disgusting pile of loose rock, but fortunately there is a sort-of trail almost the whole way, becoming well-defined near Timpanogos itself. Heading south toward the main summit, I tagged several high-points in between, one of which was presumably Bomber, pausing to admire a couple of ancient survey markers. Reaching Timpanogos, I found a perch down the southwest side of the ridge in the lee of the summit shack (replete with the expected graffiti), and probably would have taken a nap had I been able to do so without rolling off the cliff. Continuing south, I followed the well-defined trail to the saddle, then quickly suffered up the loose rock to South Timpanogos. Once back at the saddle, a nice boot-ski and glissade dropped me to the pseudo-glacier’s bowl. All the tracks I saw led to the south trailhead, but I had scoped out the return from the ridge, so I took off north, heading west around some cliffs and down into the next bowl. Where the snow had softened, I found myself postholing knee- and sometimes hip-deep — blech. While I should have stayed right, I wandered left a couple of times, since I suspected (correctly) that the trail was over there. Had I simply stayed in the chute to the right, I would have had a mostly-painless descent. I picked up the trail at the base of the chute, meeting my first hiker of the day a couple miles from the trailhead.